This peel is expensive, but also lasts for a very long time. The natural botanical enzymes work to gently exfoliate even the most sensitive skin with no harsh scrubbing or irritation. It comes in a light yellow powder form, which pours in the most incredible way. With one pour, the spout mechanism stops the flow of powder once you've gotten the right amount for one use. Now, this is some intelligent marketing since you don't actually need one entire pour for the face. I try to stop the pour half way to get a more reasonable amount. This treatment is available at Sephora. All you need to do is mix the powder with a bit of water and massage it on the skin for 30-40 seconds. I like to wet my hands before pouring the powder, since adding water after dispensing can cause over-dilution and product waste. Use your hands to mix the powder and water into a thin cream, apply to the face and neck in small circular motions, then rinse with warm water. Let me just say that the results are absolutely instantaneous. No more dry patches, seriously smoothed skin texture, reduction in pore size, improved breakouts and a clean feel without that overly tight, stripped sensation. The product has a light scent, which is a bit citrus-y. Be sure to follow up with a moisturizer afterwards. Actually, look to my next mask for a great follow-up treatment to this enzyme peel. I am currently testing the Alba Botanica Hawaiian Facial Mask with Papaya Enzyme. It’s significantly cheaper than the AmorePacific peel, but it won’t last nearly as long. I will hopefully share a comparison review in the future to confirm if these products do indeed provide similar results. This mask is available at Shoppers Drug Mart in Canada. "Apply generously in a thick layer to dry face and neck. Allow to absorb for 10 to 15 minutes. Gently tissue off any excess. Finish by spraying a fine mist of Avène Thermal Spring Water. Can be used once or twice a week, according to the skin type and condition." I don't always apply the thermal water afterwards, since I don't find that it makes a huge difference. If you happen to own thermal water to begin with, try it out if you desire more moisture and freshness. No matter what, my face always looks the absolute best when I wake up after using this mask before bed. No redness, no congestion, no excess oil. Just happy, plump, smooth skin. Without a doubt, this treatment will be the product I stock up on at the Pharmacie when I venture off to France in July. No wonder all of the top makeup artists swear by it! I am currently testing the Clinique Moisture Surge Overnight Mask to see how it compares. 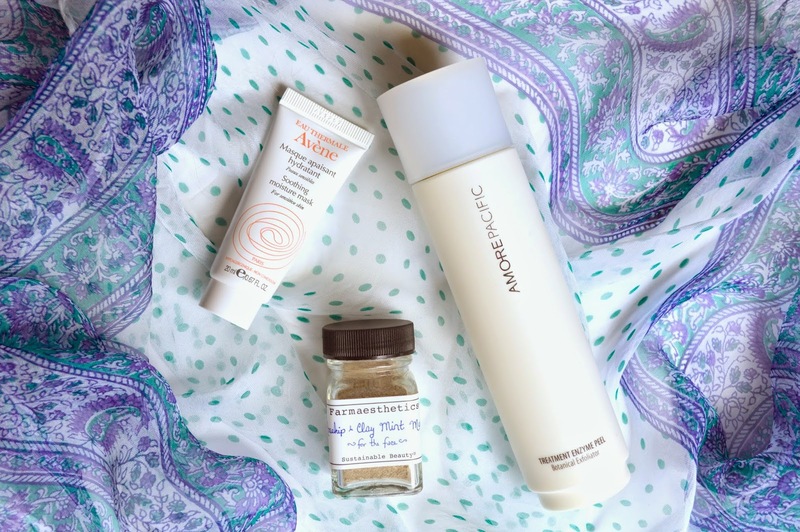 So far, I do believe that the Avène mask is a better product since the Clinique doesn't seem to sooth redness and blemishes as well. I'll be sure to test it some more and eventually do a comparison review. This is also a powder product which requires some sort of mixing medium in order to apply to skin. It is described online on the Urban Outfitters site as "nature's perfect mask to decongest, cleanse, cool and calm all skin types. Formulated with a natural infusion of Vitamin C, this potent blend of organically grown peppermint leaves and rosehips works together with kaolin clay to wick away oil and bring down inflammation - perfect for minimizing pores and spot-treating breakouts! Peppermint cools the skin, settling irritation, while organic rosehips restore you to your most-radiant self." I first purchased this product in the "Facial To Go" kit on Urban Outfitters' site, which I also plan on reviewing soon. Conveniently, the small kit I purchased included the "pure complexion tonic" which is ideal for use with this product. I pour a generous amount of the clay powder into a tiny bowl containing a small amount of rosewater/toner. I then begin to mix the two, creating a paste. You can add varying amounts of each to suit your needs. I then apply the paste to my skin (I use a cheap paintbrush to avoid covering my hands in mask), leave to dry for 10 mins, then buff off with lukewarm water. The peppermint leaves in this mask are quite intense- they leave a true tingle and cooling sensation. I definitely notice that it makes my pores cleaner and tighter, and my face brighter and fresher. Although this mask has a bit of a funky nature smell, it isn't offensive. Just make sure to wash it off thoroughly to avoid having the smell (and leaves) linger on your skin. Since this is such a unique blend of ingredients, I would combine a bit of my Aztec Secret Clay or French Green Clay with some dried mint leaves and a bit of rosewater spray to create my own version of this natural mask. In addition, rose hip seed oil could be included into the blend for some additional skin rejuvenating and brightening benefits. It is so important to take some time every now and then to show yourself some love. Put on a mask, paint your nails and just reeelaaax. Life is too short not to!